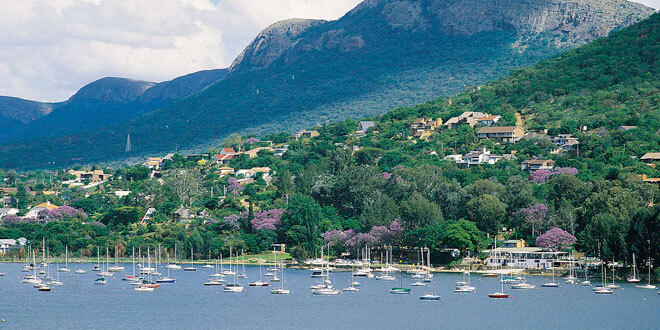 Hartbeespoort Dam is a favourite amongst travellers with a sense of adventure. The dam itself promises a world of excitement in the way of water sports. These include tubing, water-skiing, sailing, swimming, kitesurfing, hydrofoiling, parasailing, jet-skiing, and indulging in a restful sunset cruise. The scenery is spectacular and the cool waters are inviting on a hot South African summer day. Just north of the dam is the open-cast chrome mine at Miracle Waters, which is a magnificent dive site that plunges 33 metres into the earth. It has fabulous visibility and divers can expect to see an aeroplane and a bus among the objects that saw their demise at the bottom. The Hartbeespoort Dam is nothing short of aesthetically pristine. It occupies 1 620 hectares and is nestled in the valley of the dramatic mountains all around it. This idyllic setting and the beautiful climate of Gauteng are irresistible to seasoned travellers that come back year after year. The Crocodile River is nearby, and also offers some fantastic activities; including white water rafting, canoeing, tubing, and cable slides into the river. The Magaliesberg Mountain Range surrounds the dam and the town. In addition to being one of the oldest ranges on the planet, these mountains are great for hiking, quad biking, abseiling and rock climbing. Still, the best way to experience this region and its inordinate beauty is, undoubtedly, from the heights of a hot air balloon ride over the mountain range. Feel the crisp, fresh air against your face as you drink in the magnificent 360-degree views of the North West Province’s landscapes. Paragliding and hang-gliding also promise incredible bird’s eye views of the surrounding splendour. The town of Hartbeespoort is small, but pretty. It is situated on the slopes of the Magaliesberg and the banks of the dam; a formidable combination of breath-taking natural vistas. It includes the smaller towns of Kosmos, Ifafi, Melodie, Meerhof, and Schoemansville. Visitors that love Africa’s animals and want to enjoy a close-up encounter should visit The Elephant Sanctuary Hartbeespoort Dam and the Bush Baby Monkey Sanctuary. At these two facilities, many species are homed and cared for. Visitors can enjoy feeding, walking with and riding the elephants; and strolling in the natural forest habitat of the many different monkeys.